> iPass > 4G Revisited. The continued evolution of wireless mobility. A few short years after 3G service brought us anytime, anywhere broadband-and before Apple rolled out its 3G iPhone-4G networks began raising the bar in select markets. This latest evolution in wireless networking offers faster wireless data transmission speeds, vastly superior coverage and support for a new generation of mobile applications and services. 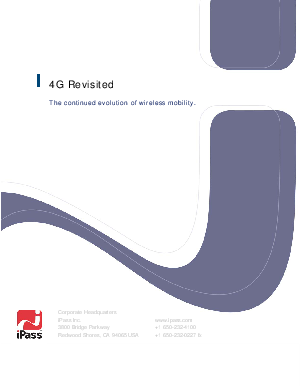 This white paper examines the two leading 4G technologies and the current status of deployed 4G networks. It continues with advice on managing long-term 4G costs, andconcludes with a discussion of next steps and our position.